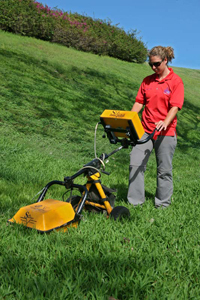 Hawaii Geophysical Services LLC, offers a wide range of Ground Penetrating Radar (GPR) services in fields such as general construction, geotechnical, environmental services, and archaeological investigations. Since its inception in 2002, we have employed GPR technology for subsurface surveys that include finding the locations of USTs (underground storage tanks) at over 80 gas stations on Oahu and neighboring Hawaiian Islands, as well as locating over 2 miles of buried Army communication cables under an unimproved dirt road. With much success in this application, HGS expanded GPR services and worked on the pre‐construction underground clearance of cell towers on all Hawaiian Islands. The GPRs are frequently used to clear the area for environmental borings, and have been used to locate underground voids pre construction as well as under existing structures. HGS employs full time Geophysical Technicians who operate the GPRs and analyze data collected. We are able to provide in‐depth Geophysical Findings Reports to our customers.